Stunning pictures have revealed how far the $730 million demolition and rebuilding of one of Sydney’s iconic sporting venues has come. 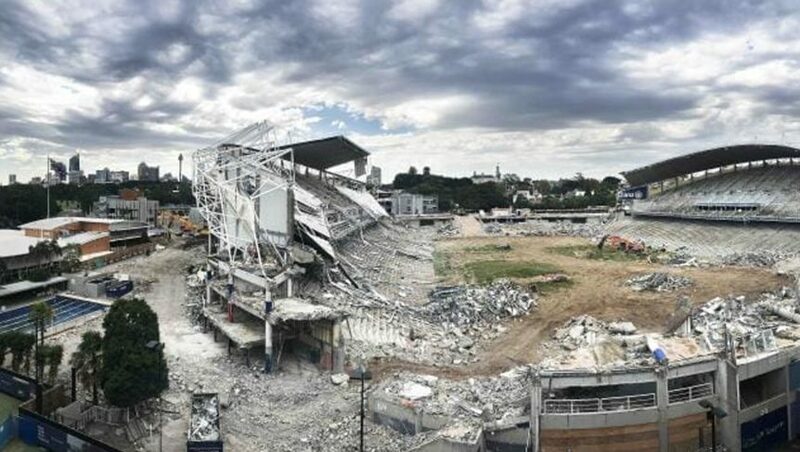 Allianz Stadium in Sydney’s Moore Park now looks more like the setting for a post-apocalyptic zombie film, as shredded concrete and twisted metal lies strewn across the pitch. The north and south stands remain standing, but the seats have been stripped out while the roof is being torn down in stages. Looking at the pictures, it seems like a long time since the recent NSW state election, when saving the sporting venue was at the heart of Labor’s campaign. But a victory for Gladys Berejiklian means the 45,000-seater venue is on track to be completed in 2021. “If it was a private asset, owned by the NSW Cabinet, and there was a 50/50 chance that in nine days the value of the asset could be realised, would they have sent the dozers in?” he asked on Twitter.